Another Twickers day out on the bus to Thruxton made all the more special with a spectacular Twickenham win by Natalie Creswick that will hopefully escalate her from 4th to 3rd cat. The win made all the more special by the presence of 2 1st cat riders who were unable to organise the bunch to catch her. 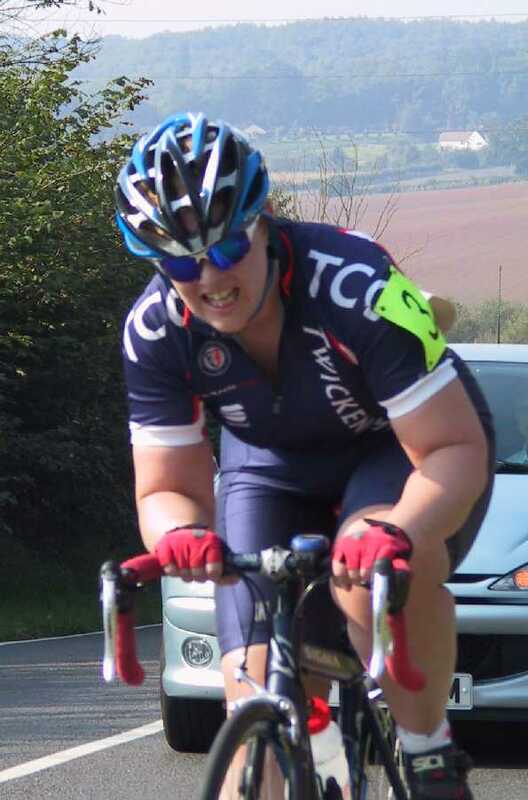 Well... the bunch was initially led by TCCs Gaby Drozna in her 2nd ever race who did a brilliant job of controlling the pace on lap 1 whilst Lisa West, Ann Marshall, Natalie and Jill Parker (back for her 2nd race with us) sat happily behind her in the bunch. From my good vantage point (ahem) at the back of the bunch, I shouted 'attack attack' when out of the corner of my eye a girl went screaming up the outside. A furious clicking of gears and people standing up to sprint to reel in the lone rider occurred and everyone sat back down - 'that's 2 girls dropped already' I said to Gaby who was comfortably sitting in the bunch again. Then another attack and I'm yelling 'go go go' to the Twicks girls at the front. Lots of effort was expended to stay in the bunch and then I looked ahead and saw Natalie was almost a dot on the horizon already. Afterwards she said she was in the break but when she took her turn on the front, she looked behind her as no-one was coming through and saw that her fellow escapees had gone back to the bunch. By this time she had put a good 100m into us. I rode up alongside Jill to see what she was going to do as we both thought she wouldn't be able to stay away and Jill, quite rightly decided, she couldn't go because she would only take the bunch with her. 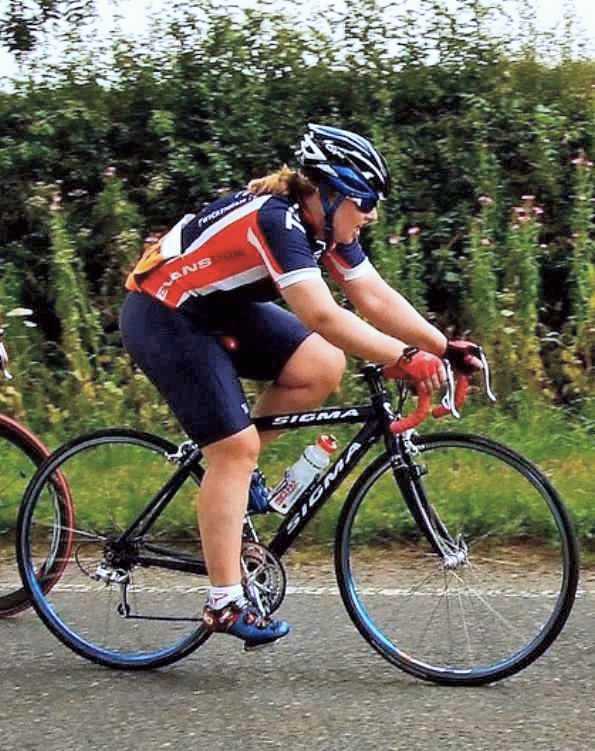 Jayne Paine (one of our Twickenham Team guest riders) but today riding for her club Willesdon, made a gallant attempt to catch Natalie. Natalie waited as she thought she could do with a hand but Jayne had expended so much effort to catch Natalie, she blew up when she caught her and couldn't stay on. 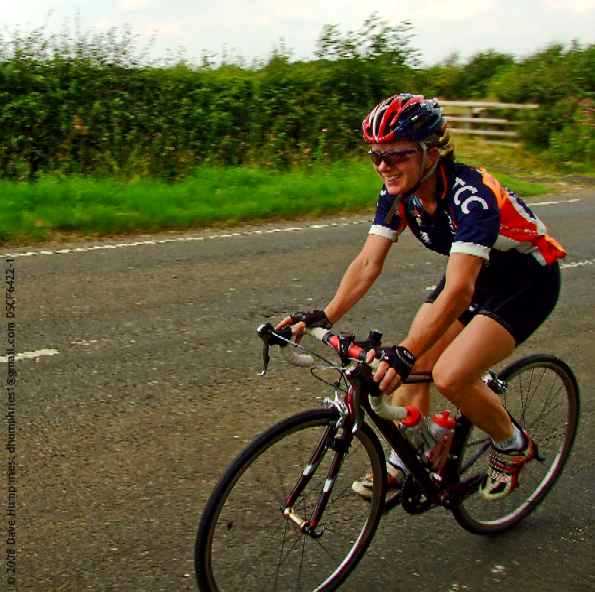 So Natalie stayed in front gaining half a lap advantage on the bunch and so it stayed for the remaining 6 laps of the 10 lap race - Respect to Natalie! The remaining Twicks girls stayed in the bunch and provisional results showed Jill 6th, Ann 8th and Gaby 9th - brilliant 4 girls in the top 10. I came in somewhere after that my efforts spent shouting earlier on in the race!!. Will McFarland rode in the frenetic 4ths race in a huge field of some 80 riders - he was unable to get near the front and was frustrated with finishing some way down. 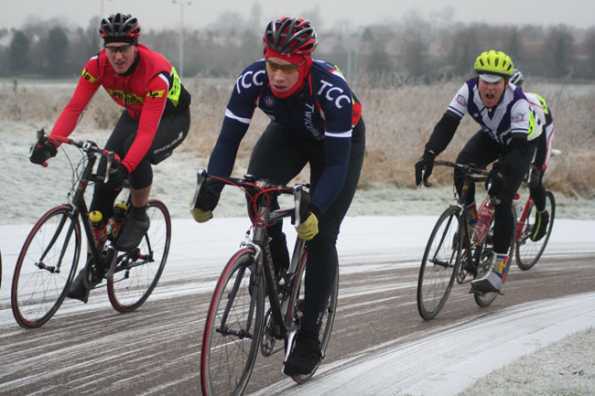 Tom Sutherland, Mark Spindler, Josh Worrall, and Dave Peck rode in another massive field in the 3rd cat race with no-one seeming keen to make a breakaway. Tom unfortunately had to scratch after he managed to ride over an open safety pin - sabotage we thought. Josh followed ex- Twickenham rider James Leach up the inside of the chicane to try and sneak through for the sprint but Josh got pushed onto the rumble strips and did very well to stay up but of course lost lots of places. Dave and Mark also got squeezed out in the last chicane before the finish so no-one made the top 20. All in all a good day out in the glorious sunshine - first time out for the shorts this year! Much discussion ensued on the return journey of how great the circuit is with much enthusiastic talk about returning next week-end. The best bit (apart from Natalie's win) was when we pulled into the car park with the minibus and 8 bikes on top - you should have seen the looks of awe on people's faces. Thanks to Barbara for driving and sorting us all out - another good day for Twickenham!